Paris 21 August 2018. Pakistani Community of France Celebrated Eid ul Adha with religious sanctity and fervor. 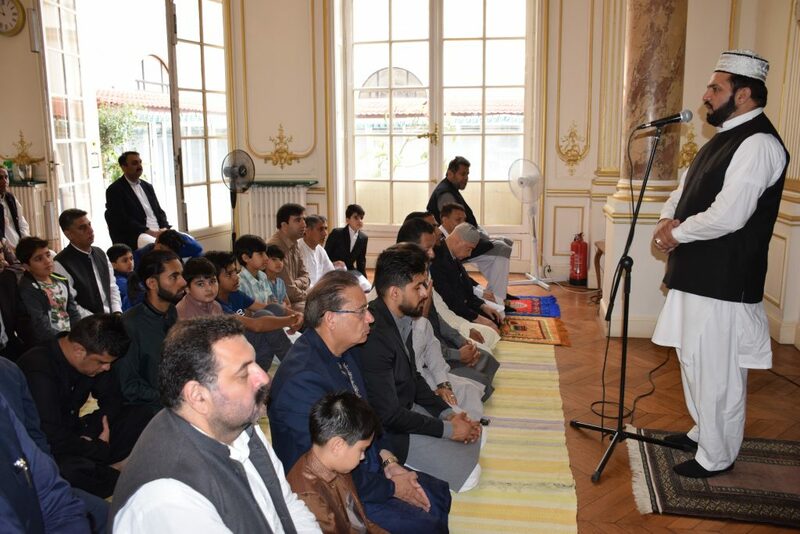 Special arrangements were made at the Embassy of Pakistan to France where community members, officers and staff of the Embassy along with their families offered Eid Prayers in large number. 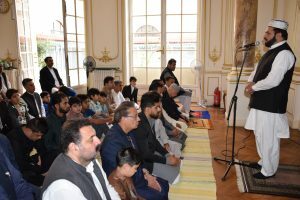 Ambassador of Pakistan to France Moin ul Haque in his message to the community termed Eid ul Adha as an important festival celebrated in memory of the supreme sacrifice of Prophet Ibrahim (A.S.) which reflected his absolute submission to the will of Allah. In his message the Ambassador said that Eid is a great opportunity to extend compassion and kindness to the less fortunate and prayed to Almighty Allah to bless all Pakistanis and Muslims around the world with the true happiness and understanding for the great religious act of sacrifice. The Ambassador also extended his warmest wishes to the Pakistani Community of France and congratulated everyone who performed the Hajj this year. Paris 14thAugust 2018: A simple yet dignified flag hoisting ceremony was held at the Pakistan Embassy in Paris today to celebrate the 72nd of Pakistan’s Independence. 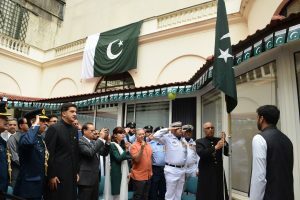 Members of Pakistani community, officers and officials of the Embassy, their families and media persons attended the ceremony in large number. Special messages of the President and the Prime Minister felicitating the Pakistani nation on this auspicious occasion were read out. The Ambassador Moin ul Haque in his address congratulated the Pakistan community and entire Pakistani nation on this historic occasion. He paid rich tribute to founding fathers for their tireless efforts and countless sacrifices for the creation of Pakistan. The Ambassador congratulated the people of Pakistan for exercising their right to vote which for the first time in the history of Pakistan would marked a peaceful transition to a third democratic elected government. He added that with this successful elections and peaceful transition of power, democratic institutions in the country have been strengthened. He expressed confidence that all the Pakistanis whether living in Pakistan or aboard would work together for the country’s growth and development and to realize the vision of our founding fathers for making Pakistan a modern and prosperous state. Later, three bright French students of Pakistan origin were awarded Jinnah Scholarships for outstanding academic achievements. The Jinnah Award was instituted this year by the Embassy of Pakistan to France to acknowledge academic achievements of Pakistani students in France. Paris 5thJuly, 2018. A Mango Festival was held today at the Rungis international market in the outskirts of Paris. Spread over an area of 234 hectares, Rungis is among the largest wholesale markets of the world for agricultural and food products. With a view to introducing Pakistani mangoes in French market, famous varieties including Sindhri, Chaunsa and Anwar Rotal were transported from Pakistan for the festival. A Pakistan Pavilion was set up in the market, where mangoes were offered to visitors for tasting and given as gifts. Mango drinks were also offered. Speaking on the occasion, the Ambassador of Pakistan to France Mr. Moin ul Haque thanked the President of Rungis Mr. Stephane LAYANI and Mr. Xavier ESPANA, the founder of Rungis market for gracing the event. He said that the festival will hopefully lead to kick start the export of Pakistani mangoes to France in large quantity. Mr. Babur Durrani, CEO of Darrani Associates, which sponsored the shipment of mangoes was also present. The festival was attended by a large number of major wholesale fruit sellers and buyers, who not only supply fruit to the local French market but also cater to other countries of Europe. The buyers/visitors enjoyed the delicious mangoes and expressed keen interest in exploring possibilities of importing Pakistani mangoes for the French fruit markets. 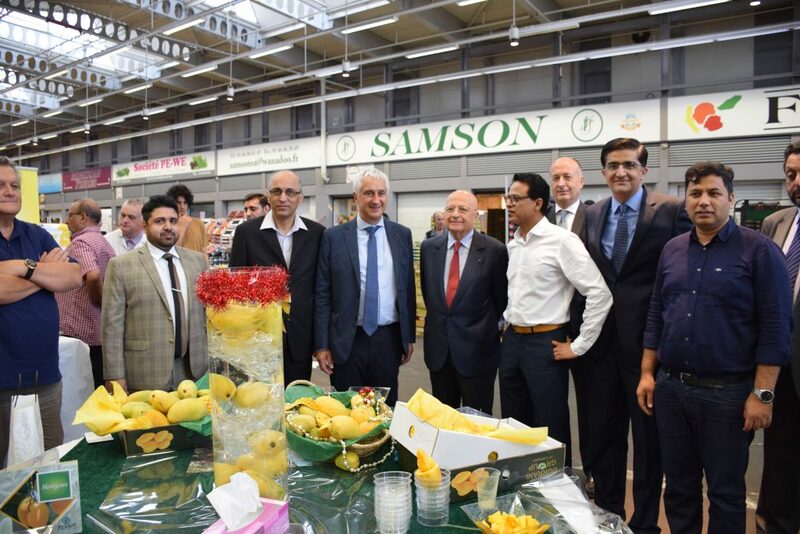 The festival was jointly organized by the Embassy of Pakistan in Paris, Trade Development Authority of Pakistan and M/s Durrani Associates, the largest mango exporters of Pakistan.